Category: Shiromi (white fish). Season: fall to winter. While you could consider kamasu to be shiromi (white fish), its flesh, oil content, appearance, and flavor profile places it somewhere between hikarimono (silver, shiny fish) and shiromi. Not usually considered to be traditional Edomae-zushi neta, it is still a popular and tasty nigiri topping. Kamasu is a very fast predatory fish that can swim upwards of sixty miles per hour and can reach up to five feet in length, although specimens used for sushi are much smaller and usually only weigh less than a pound. The best kamasu comes from Kanagawa prefecture just south of Tokyo. 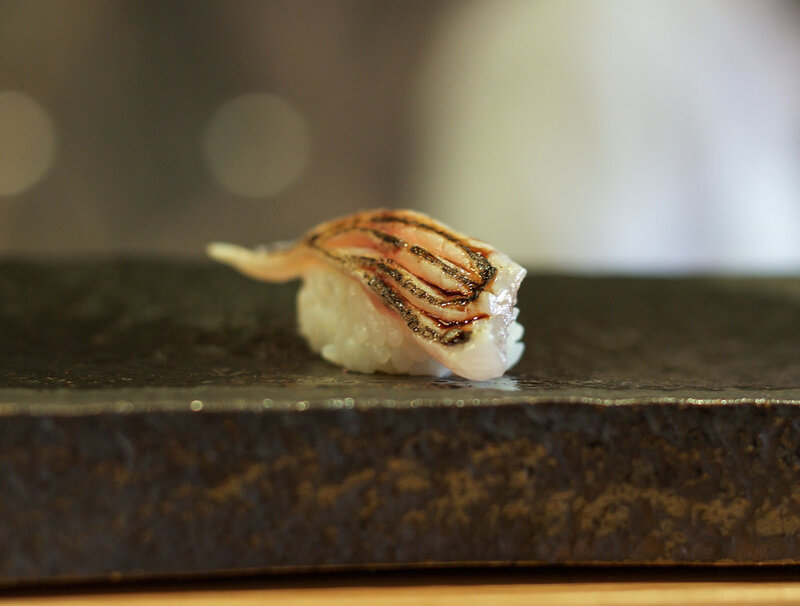 As pictured above, it is usually served with some of its skin still on, lightly seared “aburi” style, and with some minced ginger accompaniment. A tasty, mild-flavored fish that is deservingly popular.